Ultimatebet, which has been making the wrong kind of waves as of late, finally has the online poker community talking about something positive, as they have unleashed "Roshambo" on the public. For the uninitiated, "Roshambo" is Rock, Paper and Scissors. You may laugh, but there is actually a great deal of strategy involved in this game. In fact, there is even a World Roshambo Championships. Some people are left to wonder though; why is Ultimatebet seemingly spending so much time working on things such as Roshambo, while their poker site is going down the tubes? 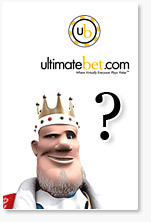 It is no secret that Ultimatebet is seemingly losing hundreds of their players per day. Their high limit games are a morgue now, with typically one big game going off per month. Offering new games such as Roshambo is great, but Ultimatebet needs to continue to focus on their flagship product, which is their poker room and most importantly, their poker software.